IN the recently concluded Lafarge-EdgeProp MYHOME survey, about 59.8% of the nearly 14,000 respondents stated their preference to live within gated communities with amenities. What kind of amenities are we talking about? Of the preferred amenities within the community, jogging trails took the lead (52.7%), followed by children’s playground (51%) and swimming pool (50%). Being able to live and enjoy leisure and recreational activities outdoors in a safe and secure environment sounds ideal; hence, the findings from the survey come as no surprise. The choice for gated communities reflects Malaysian homebuyers’ concerns about security and to have peace of mind at all times whether they are indoors or outdoors, says S P Setia Bhd executive vice-president Datuk Tan Hon Lim. However, contrary to popular belief, living in a gated community does not guarantee a completely safe environment all the time, he says. “Thus, residents and property managers must collectively come together and take proactive steps to build a safe community,” he adds. For instance, measures must be taken to ensure that the security system is always in good working condition, that proper security personnel are hired and that any suspicious activity is reported. “There are many ways to enhance safety and security. In our flagship township, all the precincts in Setia Alam are safeguarded by perimeter fencing and natural barriers such as hedges and streams. The single access point is closely monitored by security guards. This goes to show that with good planning, we can ensure that not only is the safety aspect taken care of, but it is also done in an aesthetically-pleasing way,” he says. While you’d want to feel safe while taking a stroll around your neighbourhood, you’d also want to be safe when you’re at home or within the premises of your condominium. People tend to forget the many potential safety hazards within our homes or buildings. In fact, we are probably unaware of most of them. Architect Centre Sdn Bhd accredited architect and trainer Anthony Lee Tee points out that there are plenty of safety hazards that can be found both in the outdoor common areas or facilities as well as within the home. “Ill-conceived and poorly maintained facilities and common areas such as dilapidated children’s playground equipment and wiring for outdoor lighting and water pumps will create safety hazards. They could also contribute to mosquito infestation and body injury,” he says. On top of that, some facilities might not have been built with the right materials and thus create safety and sustainability concerns. “As shared spaces in communal living are becoming more common today, it is vital that the spaces are designed and built with the right materials to ensure suitability, safety and durability,” says Lafarge Malaysia Bhd president and CEO Mario Gross. He cites walking pathways and jogging tracks as examples. “[These] should be designed to be non-slippery with no trip hazards, especially for young children and the elderly. There should not be missing pavers or tiles. “Lafarge has a product called Hydromedia, which is a pervious concrete. It is perfect for use in jogging trails, bike lanes and even pathways of the children’s playground, as it allows rainwater to flow right through the material into the ground. Thus, there is no water ponding or slippery surfaces. It is already being used in many public parks around the country,” he offers. 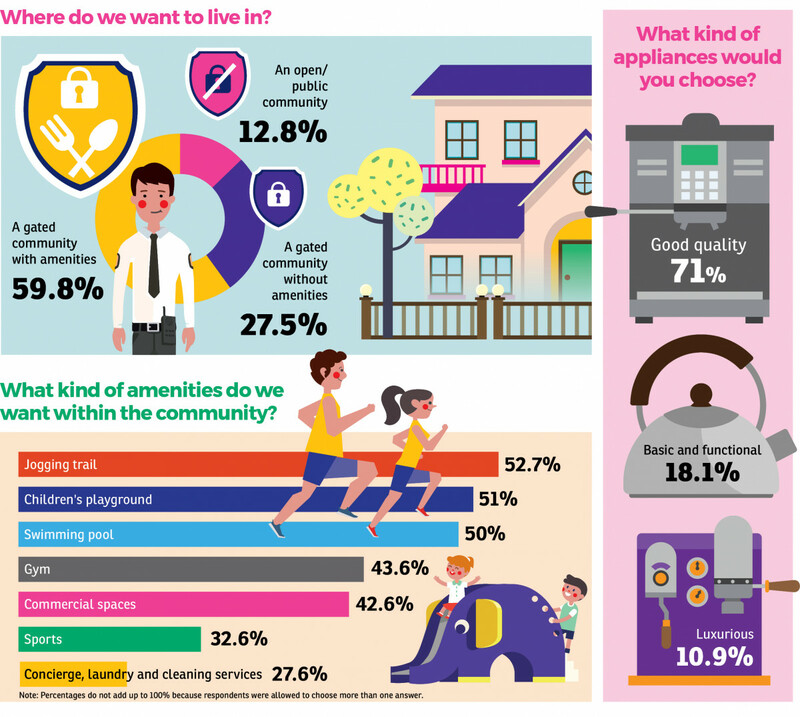 Meanwhile, when it comes to choosing appliances, 71% of the MYHOME survey respondents chose good quality appliances over those that are basic and functional (18%) or luxurious ones (11%). This also reflects their wisdom in choosing safe and lasting household appliances. However, Lee highlights that sometimes, electrical appliances that we thought are safe can be unsafe too if not installed or maintained properly, and cites instant water heaters as example which can cause electrocution. According to Lee, considerations for future maintenance, repairs and replacement (MRR) must be incorporated in the design specification, selection of materials and construction of a property from day one. “MRR should not be an afterthought. An award-winning property with skin-deep beauty that does not consider the MRR early or does not incorporate MRR as part of their DNA will invariably decay. In many instances, a decaying property will become unsafe and lose its value and yield. On the other hand, a property that incorporates MRR will be cheaper and easier to manage and maintain in the long run,” he says. This story first appeared in EdgeProp.my pullout on June 8, 2018. Download EdgeProp.my pullout here for free.